20 years ago, ACID set new standards for musicians and producers with its loop-based music composition. Now it's time for a creative revolution for drummers! Freedrum Kit is a ground-breaking and original device that allows you to drum anywhere and anytime. Got a great drum groove in your head? Then play it immediately on your PC or laptop. Just want to practice? Then use your smartphone as a virtual drum set, wherever and whenever you want! 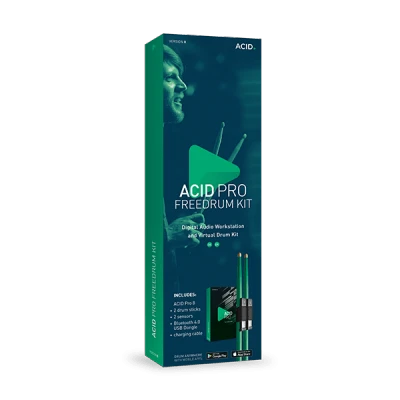 With Freedrum's drumsticks you can record spectacular drum grooves in ACID Pro. Connect the sticks to your PC/laptop using the USB Bluetooth dongles, and then simply activate the Freedrum sensors in ACID Pro as your MIDI input devices. Then you're ready to start drumming! You are on the road but you just want to drum? No problem at all! Install the Freedrum app for Android or iOS on your smartphone and connect the sticks to your phone. Set up your drum set for left- or right-hand playing and you're ready to go. Freedrum's six hit areas give you the authentic feeling of playing on a fully-equipped drum set. These can also be easily adjusted via the MIDI standard. Get realistic feedback from your bass, snare, toms and hi-hat, all thanks to close-to-zero latency and accurate velocity sensitivity via Bluetooth sensors. The sensors allow you to expand your hit areas by rotating the sticks. This gives you a unique and much more versatile drum sound than ever before. 20 years of legendary loop-based music composition – that's what ACID Pro stands for. Version 8 continues this tradition and refines the concept with versatile tools, instruments and effects that make it a powerful 64-bit DAW for the next generation of creative artists and musicians. ACID Pro 8 features a new, modern interface coupled with a powerful 64-bit engine. As a creative DAW, it combines professional features with inspiring loop-based music production. Unleash your creativity and turn your ideas into reality even faster. Whether you're composing, mixing or remixing, get it done in ACID Pro. ACID Pro 8's MIDI sequencing lets you edit your MIDI files in real time and precisely control MIDI events. You can also automate and modify modulation effects, expression, and other instrument data with sophisticated track envelopes. With the new ACID Pro, you can automate control surfaces and track channels for devices like Mackie Control and Frontier Design TranzPort. The Beatmapper tool makes remixing a breeze, and the Chopper tool lets you create stunning drum fills, stuttering and DJ effects.